Gina Jensen was honored for longtime service to the nation's oldest and largest forensic honor society. 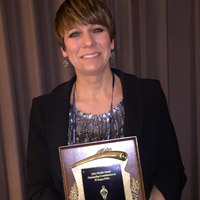 Gina Jensen, director of Forensics and adjunct professor at Webster, was awarded the John Shields Service Award from Pi Kappa Delta this past weekend at a national meeting in Philadelphia. The award is an annual recognition of somebody who has provided exemplary service to the nation's oldest and largest forensic honor society. Over the past two decades, Jensen has served Pi Kappa Delta (PKD) as its national president, a two-term national council member, its national tournament director, and the host of two national tournament and conventions. She is also a regular member of its national tournament staff and has published in its refereed journal. Learn more about Jensen in this Webster: Voices profile. Christopher Braig, adjunct faculty member of jazz and alumnus of the Department of Music, has completed a new online resource teaching jazz improvisation. 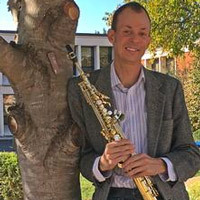 The site, www.jazzbraintraining.com, has grown out of Chris’s work at St. Louis Community College-Meramec, where he teaches jazz, audio production, and saxophone lessons. At Webster, Braig leads jazz combos and teaches each summer in the Webster University Jazz Camp. He released his first disc of original jazz compositions last month as well. “We are always telling friends and students about our roster of artist/teachers,” said Jeffrey Carter, chair of the Department of Music in Webster's Leigh Gerdine College of Fine Arts. “Chris is the real deal, taking his own revelations from the classroom and studio, putting them into a teaching-and-learning format, and sharing new ideas with others. He joins a healthy list of practical practitioners with this publication." Braig received both his Bachelor of Music Education and Master of Music in Jazz Performance degrees from Webster University. An Army veteran, he is a graduate of the United States Military Music School in Virginia. English Department adjunct faculty member Deborah Jackson Taffa published her essay "This American Paradise" in the Sunday Rumpus. Read it here.